Inc. magazine ranked STONE Resource Group No. 2484 on its 35th annual Inc. 5000, the most prestigious ranking of the nation's fastest-growing private companies. The list represents a unique look at the most successful companies within the American economy’s most dynamic segment— its independent small businesses. Companies such as Microsoft, Dell, Domino’s Pizza, Pandora, Timberland, LinkedIn, Yelp, Zillow, and many other well-known names gained their first national exposure as honorees of the Inc. 5000. 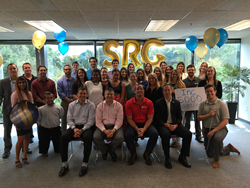 STONE Resource Group, founded in April 5, 2010, is an Atlanta based, Minority firm specializing in IT Staffing and Consulting. STONE is a quality driven organization delivering Contract, Contract to Hire, Direct Hire and Project Services in the Applications, Infrastructure, Telecommunications, and Finance & Accounting space. Having recently expanded to new markets in Dallas, TX and Denver, CO, in 2016, STONE is on the path for another year of successful growth.